The first principle talks about inclusivity of all kind of energy services-customers whether for lighting and mobile phone charging or even home ventilation, refrigeration, irrigation and agro processing. Providing basic energy services such as lighting, mobile phone charging etc will help households in raising their income and in turn encourage them to increase their energy usage for other requirements such as solar irrigation and solar on-grid-back-up in place of diesel. But solar generation can only be facilitated by the use of highly energy efficient appliances which requires the governments mandating programs that encourage upstream manufacturers in developing and deploying such appliances. The second principle describes the importance of building markets from the bottom up by attracting new customers by use of pico solar products such as solar lanterns and solar home systems which will be best suited for a population on the 1st step of the energy ladder. These markets are already growing swiftly. 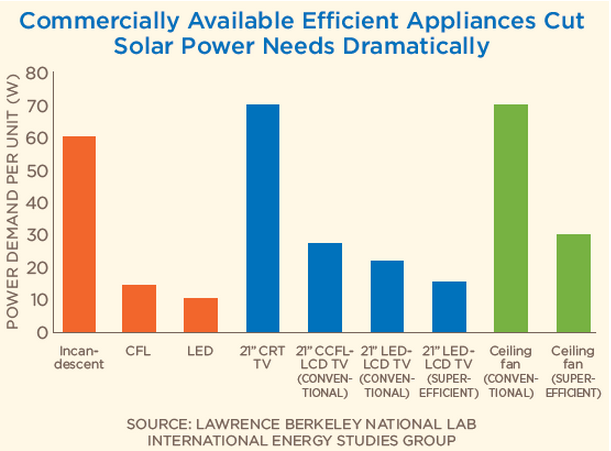 Though the larger solar solutions have been slower to mature they offer cheaper per kWh price – the cost per kWh is naturally higher for smaller panels and lower for larger panels. Larger panels can also be used to address high energy uses such as refrigeration, agro processing etc. or for minigrids to serve multiple customers who are nearer to the minigrid. Batteries which are similar to solar in terms of cost per unit of energy can be used in combination with solar to present a more cost effective and viable solution. 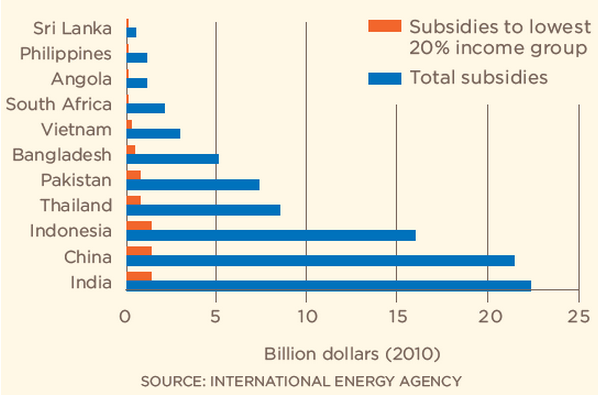 The third principle talks about how many countries heavily subsidize fossil fuels – obstructing development of the clean energy sector since it looks costlier in the already unequal energy playing field. Additionally the taxes applied by several countries on solar products hinder the growth of off-grid markets. The multiple taxes; import duty, excise duty, VAT and surcharges can increase the cost of solar systems to as high as 30%. Providentially, some countries have already started updating their tax laws to enable development of the clean energy field, India, having one of the largest populations with no access to electricity, has started a direct subsidy programs under which funds are given directly to the benefactors rather than sending through subsidized fuel. The fourth principle points out another problem which is the availability of finance to consumers as well as green energy businesses. Since the capital investments are substantial, countries should establish a dedicated loan guarantee fund to support these renewable energy services companies. Implementing a Rural feed-in Tariff(RFIT) to public and/or private partners can also help in this case. Additionally a mandate for banks and other financial institutions to offer consumer finance for solar LED products will significantly facilitate such markets. The fifth principle explains why defining the utility regulations in minigrid and off-grid space is of utmost importance. The recent initiatives of Uttar Pradesh and Bihar state governments in India to regulate the prices charged by off-grid providers on a $/kilowatt hour basis ignores the fact that the actual benchmark for fair pricing should be the diesel and kerosene prices – not the grid rates. Also governments should establish transparent quality certification systems for solar appliances and SHS, as it does for other type of home appliances so that minimum quality standards can be maintained. Following these principles will ensure that the off-grid energy sector is given optimal conditions for sustainable growth – cutting emissions on a massive scale and serving the 1,2 billion people living without energy access today.